Araucaria are a group of evergreen large trees, most gardeners will be familiar with some of the species yet may not know their name. Widely planted in parks and gardens across Australia they are used as landscaping trees, feature trees and windbreaks. Most are large growing trees and are suited to broader landscape plantings. A number of nurseries are growing increasing numbers of these hardy an magnificent trees. It is the Norfolk Island Pine that is most commonly grown and can be found in many coastal locations around Australia. All species can tolerate high temperatures once established. It is interesting that these trees are grown as indoor plants in Europe. Araucaria heterophylla – Perhaps the best known species, commonly called the ‘Norfolk Island Palm. Found widely planted in coastal areas around Australia. Araucaria bidwillii – This is the ‘Bunya Pine’, very large cones that can weight 8 – 12 kg. Araucaria araucana – Known as the ‘Monkey Puzzle Tree’, very prickly branches that deter people (and Monkeys) from climbing them. 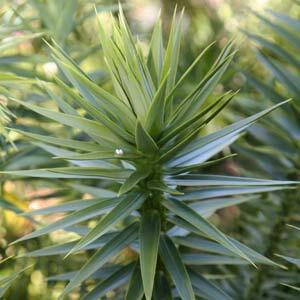 Araucaria angustifolia – Commonly called the ‘Parana Pine’ has a nice pyramidical habit in early growth and also produces edible nuts. Araucaria columnaris – A very upright tree commonly called the ‘Cook Pine’ which is used as an indoor Christmas tree in some countries. Araucaria montana – Very distinctive with a flattened top, a fairly upright habit. Araucaria luxuriens – A conical growing species with a narrow crown. All are evergreen coniferous trees and all are best suited to parks, large gardens and commercial plantings in broader landscaping projects.